This linear view lot features a great landscape around the pool and the adjacent raised spa. The covered outdoor kitchen with beautifully installed stone veneers blend with large succulent trees and raised planting for a more verdant space despite such dominant hardscape. The long shade arbor adjacent to this glass tile pool offers a wide range of seating options as well as a bar for outdoor dining. The wall also provides privacy, blocks wind and creates a backdrop for the lightly shaded spaces. This hillside creation is a marvel of artificial rock and plants that together become an eyeful when viewed from low level outdoor living spaces. The abundant planting illustrates how important it is for making the stone feel natural. A well designed pool landscape doesn't eliminate plants because they are key to solving problems. Plants will screen off unattractive views or create privacy. Plants can ground a naturalistic pool to soften the rock work and make it appear more realistic. The integration of greenery of any kind is what turns a pool yard into a gorgeous landscape, particularly when foliage and flower colors are coordinated with the overall site palette. Planting is essential to the fantasy backyard. The use of tropical appearing plants is what gives a grotto water feature the look of the South Pacific. For modern landscapes, plants are used in a wholly different way where their forms and textures are an artistic statement in high contrast against industrial materials choices. Your pool won't exist in a vacuum. It's a vital part of the whole backyard where the landscape provides the perfect setting. This is why pool design is best done by a landscape architect who understands the big picture of site function and circulation so the pool is placed in the most optimal location. "People are looking for creative solutions for their property, " says Chris Cipriano of Cipriano Landscape Design in New Jersey. "The twenty by forty rectangular pool isn't in style any more. They want an enjoyable environment for themselves and their children. No longer holding the status of just a "swimming pool, " yards now hold the capability of a private oasis retreat. Customary traveling vacations are limited in a busy family's schedule. This makes the most valuable entertainment place their home, which also makes safety and health facets especially significant." "Early in the design process we work hard to establish our clients’ wants and needs through a detailed lifestyle survey. Luxury pools and spas are all about exceeding expectations and enhancing the lifestyle of a family. Our business model is designing and building the entire landscape and that's how we became the top company in our market." 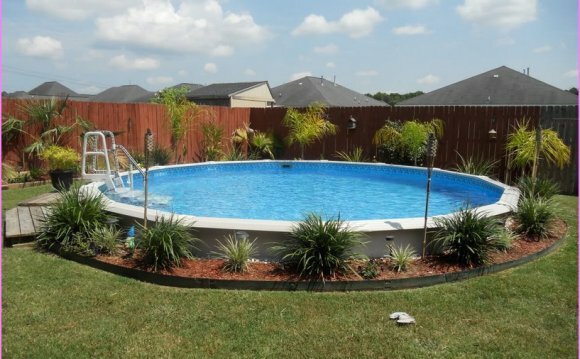 It's important then to consider the landscape as a frame for your new pool. It should enhance pool design and solve problems at the same time. The hardscape will vary according to the style of your pool which can range from streamline modern to a fantasy rock and waterfall oasis. RocksThe world of rock accents around pools is divided between artificial stone and natural stone. The difference is that natural stone must be hauled and set on site, and due to its weight the use of large boulders can present costly engineering challenges. This is why artificial pool boulder systems are growing in popularity because they are more adaptable to both the site and pool with many more options for you to choose from. What is key, however, is to design planting in association with this rock work to give it a realistic appearance and a solid foliage background for high contrast. In southern California, Alderete Pools is an outstanding luxury pool builder. "Our specialty is artificial rock, " says Shea Alderete. "Consumers think they want natural rock but the reality is that artificial can look like it really belongs there. It's hard to make natural rock blend in. We have twenty years of artificial rock experience and we've carved out a special niche. Anyone wanting a rock pool needs to find a contractor that has a lot of field experience. We're like fine art painters and we do our own style well." Water featuresThe site and sound of falling water turns a static swimming pool into a beautiful fountain. Waterfalls are typically a part of naturalistic rock pools. For more contemporary or modern design, the more precise water feature is preferred with sheets of water specially illuminated with iridescent backgrounds that give them a sharp glassy beauty. A pool water feature should always be most visible from both the outdoor living spaces and from primary indoor rooms to make it beneficial in the off season too. "Our slides are big with families, " says Alderete, "and they're still in use twenty years later. We tile the whole slide so there's no maintenance. We build pools like we do for ourselves with a lifetime warranty. When you embark on a 100k project you want to be sure a company will be around in the future for upgrades or repairs. We hear horror stories and try to educate our customers so they know how important our longevity is to their value. Don't be so wary about bottom line with pool contractor selection because it's longevity of the company that's vital." SpaThe unique feature of a spa is that it is used for both recreation and health. To achieve privacy and a relaxing environment to unwind, planting and screen fences are often necessary. How planting is designed can have a big influence on the way your spa looks within the larger landscape of the yard. Pro Tip: Treat a private spa like its own garden room because it will function as a passive space compared to a pool which is a more active use. HardscapeThe limits of your hardscape options are only defined by your budget. What you build around the pool should be directly linked to your individual lifestyle and the overall design style of the site. It's important that these hardscape elements share similar color and materials palettes so that the entire site is integrated. All too often the pool area is treated separately, which divides the available space. But when it's nicely defined by the pool deck, seatwalls, shade structures and other elements that are responsive to the look and feel of your house, then the investment will pay off and you'll be wholly satisfied with the project. Pro Tip: Establish a strong materials palette based on your architecture and stick with it throughout the entire project. ShadeShade structures are highly variable and their design will relate to the style of the house as well as the overall palette of the yard. This can be attached to the house itself or freestanding within the landscape. Shade may be filtered light through a vine shrouded arbor or sheltered under a solid roof structure over an outdoor kitchen or gazebo. In very hot climates such as the desert Southwest or Florida, the need for a protective shady space adjacent to the pool is essential.